National Trail’s girls golf team finished second in the CCC, falling to Fort Loramie by a single shot in the post-season tournament. 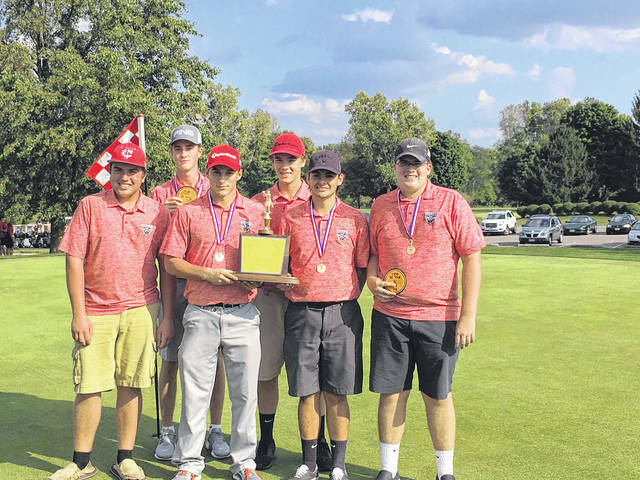 Tri-County North’s golf team claimed its first-ever CCC title. The team of Ethan Kelley, Alec Wayman, Dylan Curtin, Spencer Brehm, Matt O’Dell, and Landon Owens finished with a conference record of 23-1. 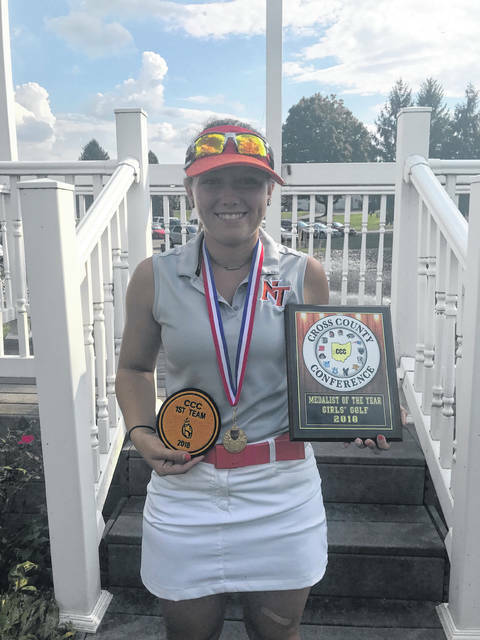 VERSAILLES — Tri-County North’s boys golf team won its first-ever conference championship last week, while the National Trail girls team finished as runner-up as Makena Jones earned her third straight player of the year honor. North’s Ethan Kelley was medalist shooting an 83 at the CCC tournament, held on Thursday, Sept. 20, at Stillwater Valley. Alec Wayman followed with an 83, while Dylan Curtin shot an 86, Spencer Brehm finished with a 93, Matt O’Dell shot 104, and Landon Owens carded a 113. 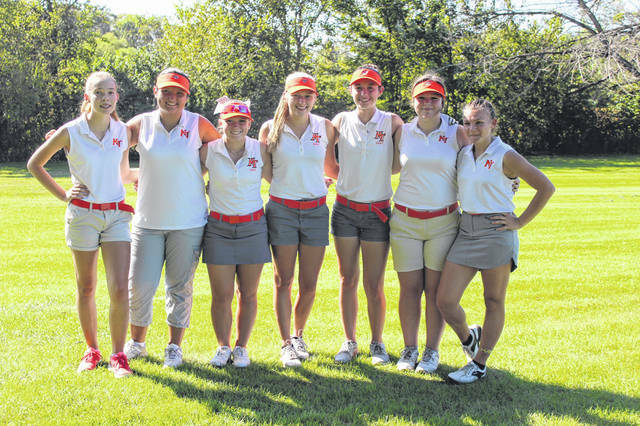 The National Trail Girls Golf team narrowly missed grabbing a share of the CCC title, losing out to Fort Loramie by a single stroke 409-410. The Blazers needed to defeat Loramie to share the crown, but just weren’t able to overcome the Redskins. Jones took tournament medalist honors with an 89, which also earned her the CCC Player of the Year. Caitlin Gilland recorded a 103 for the Blazers, while Katelyn Hines turned in a 108. Savanna Abner’s 110 was the fourth score and was good enough to earn her CCC Special Mention. The Lady Blazers end the season 16-2 overall and 12-2 in CCC play. The girls will return to Stillwater for OHSAA sectional action on Wednesday Sept. 26. Twin Valley South’s boys were seventh. Willie Bowman paced the Panthers with an 86. Steve Bitner shot a 100. Chance Parks and Connor Bradler shot 111 and 113 respectively. Jacob Clark finished with a 132. The National Trail Boys Golf team recorded a team score of 483. The boys were led by Austin Knapp’s 111, which earned him Special Mention All-CCC. Khyler Grant carded a 116 while Tyler Porter turned in a 122. Rounding our the scoring for the Blazers was Jesse Norton with a 134. All teams will be in action this week with sectional tournaments.